Tag "Birds of Prey, Batgirl"
This was one of those stories I half-loved, half-hated. As a comic book fan, I enjoyed the cast. 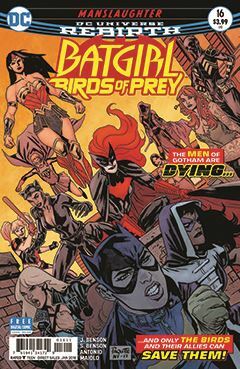 In addition to the regular heroines of Birds of Prey, it features many of the Bat-centric characters – heroes and villains – from the DC Universe, as well as Wonder Woman. The men of Gotham City have taken ill, as a deadly plague sweeps through the city, while leaving the women unscathed. As a man, I hated the US vs. THEM approach of the extreme female antagonists. It is a hate group known as Daughters of Gotham, who have escalated feminism to fascism. I resent extremism of any kind, and I don’t mind when those who have been historically marginalized are able to carve out something of their own. But I have to remind myself, these are comic books, with comic book villains, complete with masks and hand-wringing nefarious ambitions. I must address one thing about the dialogue of Harley Quinn as it is presented in this book. Unlike her ongoing title, which I’ve been reviewing for some 40 issues now, Harley’s dialogue is written in the dialect from which she comes. Her Brooklyn accent is intact, and written accordingly. I live in the Southern U.S., but grew up in the Midwest, so I have a moderate understanding of how accents can sometimes sound natural to others. It may be second nature for those from New York to mentally apply it, but for those of us in the other 99.99% of the world, it helps to have a visual cue.